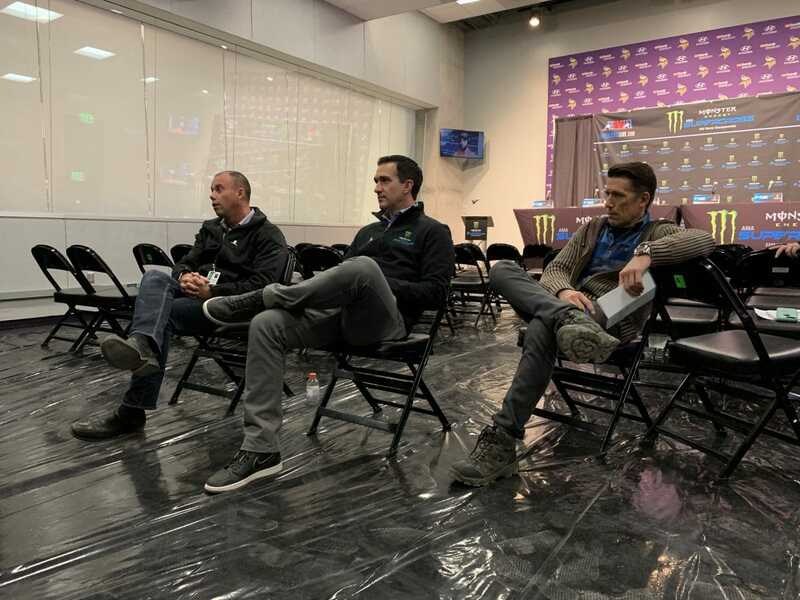 Feld Entertainment sat the media down on Saturday to give an update on the problems surrounding San Diego Supercross and the lime placed in the dirt prior to qualifying. Dave Prater , Director of Operations at Feld Entertainment, gave the media a brief timeline of the day to better explain last Saturday’s events and how they are going to move forward. The plastic was pulled off the track at 2 pm. At 2:45pm the crew started to put the lime down onto the track. There were two spots on the track that were crucial. The bowl berm between the whoop lanes and the start straight. By 3:20pm rain fell hard into the stadium. A theory by the staff at Feld is that the lime had no time to activate into the soil and instead stayed separated. The hard rain fall caused the huge puddle by the start straight to become extremely concentrated. 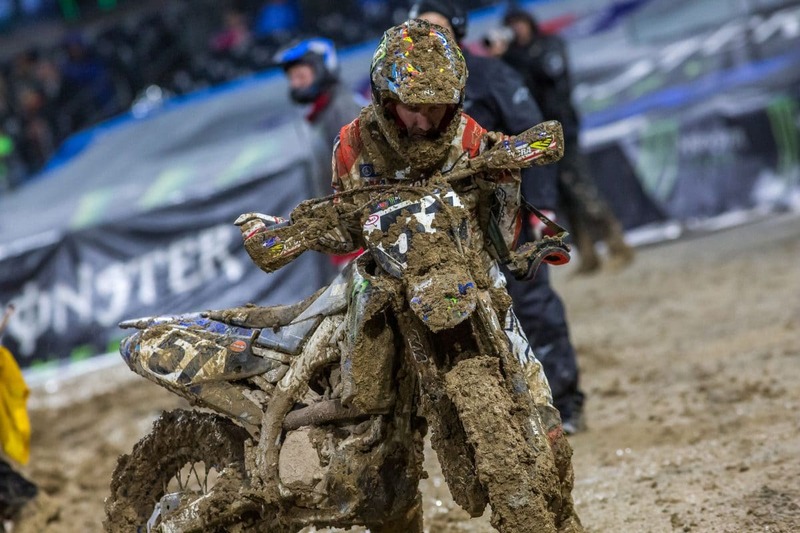 Dave Prater explained that he first became aware of the issue on Sunday after glancing at a instagram post by Ken Roczen. The entire Feld staff met on Monday and immediately started calling riders. All of last week Feld spoke with riders and apologized for their mistake. Kenneth Feld and the team worked on what they felt was a fair compensation for their mistake. The Feld Entertainment staff offered $5,000 to each rider to get them back on their feet and return to racing. When asked if every rider took the compensation, Prater did say that there were a couple who turned it down. If an athlete did change their mind in several weeks they could still get that money if they wanted. Feld went one step further and set up a room where riders could come have checks signed/dispersed in Minneapolis. Dave Prater explained that Feld had used lime in their tracks for years, all the way back to 2009. It is pellet lime and added to sand. It doesn’t add a lot of dust especially when added to sand. The team at Feld typically mixes the lime in at the dirt holding area. By the time Thursday rolls around the lime has done its job and reached a proper PH balance. The lime is used for several reasons. Feld takes the lime and mixes it in the soil to form a base as well as create a more safe track to race on. The lime helps the dirt from rutting up as bad, especially in softer in conditions like Detroit. In light of recent events, Feld Entertainment has banned the use of lime on their tracks and will continue to find a resolve for this issue. Both Dave Prater and Todd Jendro explained their concerns moving forward without the use of lime. There is a lot of question as the season continues how they will be able to build the tracks and keep the riders safe. Feld is going to hire experts to delve further into the effects of long term use of lime in their soil. The EPA did go to Petco park and take samples of the soil from Saturday night. All the samples passed upon testing.